Some of you may already be familiar with exploding head syndrome (EHS). I know I've experienced this on at least one or two occasions, and it's not pleasant. It's characterized by an exceptionally loud noise in the head (sometimes described as "an explosion" in the head), usually during sleep-to-wake or wake-to-sleep transitions. Though benign, it can be extremely stressful. Exploding head syndrome episodes by themselves are harmless. They can cause problems with a relatively small number of people if episodes happen too frequently, regularly disturb sleep, or if people react to them in unhealthy ways (e.g., by becoming really anxious before bedtime or fearing that something more serious may be wrong with them). Indeed, the effect only lasts for a brief moment, but EHS has been known to make some people think they're having a seizure or a brain hemorrhage — or that they're going crazy. Fearing stigma, some people refuse to tell their spouse or doctor (which may explain why it's rarely discussed in the scientific literature). Conspiracy theories are sometimes used to explain what's going on, such as the use of some sort of directed-energy weapon. Not much is known about the causes of EHS or its prevalence. According to clinical lore, it only happens to people in their fifties and older. Previous studies have suggested it manifests mostly among women, or among those suffering from isolated sleep paralysis. Together with his team at Washington State University, Sharpless conducted a survey to learn more. For his investigation, the results of which were published this month in the Journal of Sleep Research, Sharpless used a clinical diagnostic review to assess 211 undergraduate students for both EHS and isolated sleep paralysis. The sample size may seem a bit small and demographically constrained, but it is considered the largest EHS-related survey to date. Results showed that 18% of the students experienced EHS at least once in their lives, and that it's a recurring condition for at least 16% of them. The researchers learned that the prevalence of EHS is roughly equal among the sexes, but that it's experienced by nearly 37% of those already diagnosed with isolated sleep paralysis (ISP is an unsettling condition where a person cannot perform voluntary muscle movements or speak while waking up). Sharpless says the connection between EHS and ISP may have something to do with a common underlying physical or psychological process, or the fact that college-age students suffer more from sleep disruptions and insomnia. The study also showed that a small percentage of students experience EHS to such an extent that it's a significant problem in their life. "Unfortunately for these individuals there is currently a paucity of treatment options and limited evidence for their efficacy beyond individual case studies," write the researchers in the study. Because EHS happens when a person is falling asleep, scientists theorize that it's connected to problems with the brain's shut-down sequence. They liken it to a computer shutting down, with motor, auditory, and visual neurons switching off in separate phases. Using this analogy, the researchers hypothesize that the auditory neurons of someone with EHS fire all at once, instead of shutting down properly. "That's why you get these crazy-loud noises that you can't explain, and they're not actual noises in your environment," noted Sharpless in a release. He added that the same part of the brain — the brainstem's reticular formation — appears to be involved in isolated sleep paralysis as well, which may explain why some people suffer from both conditions. 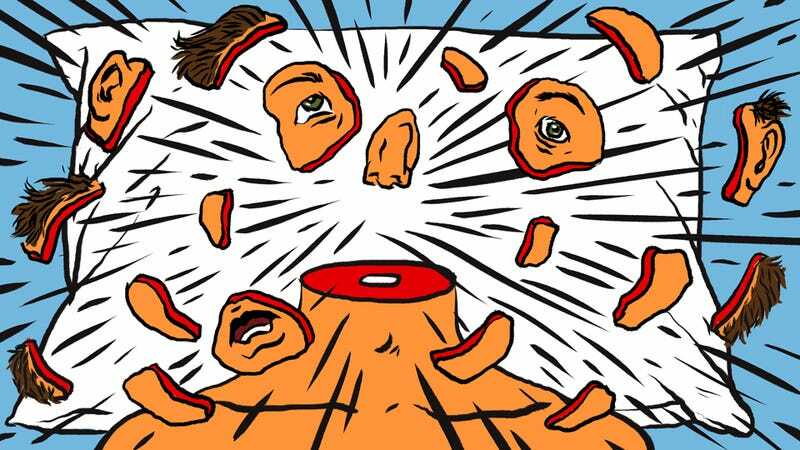 I think a more general awareness of exploding head syndrome by health professionals would be helpful, especially if they have patients reporting unusual sleep symptoms. Many people with this condition are reluctant to discuss these experiences even with doctors because they may feel embarrassed or might worry that the doctor might think they're "crazy" in some way. This study shows that exploding head syndrome is not uncommon, at least in college-aged people. Accurate prevalence rates for other ages are not yet known. The researchers urge for the development of effective treatment options, but add that, for some individuals, reassurance and education may be all that's needed. In terms of next steps, Sharpless's lab is working to determine what things might make EHS more likely to occur. "My lab is currently looking at psychological and behavioral factors as well as the relationships between exploding head syndrome and other more well-known disorders," he says. "This may lead to the discovery of new treatment options." Read the entire study at Journal of Sleep Research: "Exploding head syndrome is common in college students."